Attorney General William Barr leaves his home in McLean, Va.
WASHINGTON - Attorney General William Barr's decision that the special counsel investigation had not turned up "sufficient" evidence that President Donald Trump committed obstruction of justice seemed certain to set up a new clash between the administration and Democratic lawmakers. On Sunday, two days after receiving the results of special counsel Robert Mueller's investigation, Barr told Congress that while Mueller's report "does not conclude that the president committed a crime, it also does not exonerate him" on whether he obstructed justice. Barr said Mueller did not reach a conclusion about whether Trump committed obstruction. Barr's involvement in that decision rekindled concerns among Democratic lawmakers about a 19-page memo he wrote to Rosenstein in June 2018, outlining his opposition to an obstruction investigation of Trump. He shared that memo with White House lawyers. That memo, written months before Trump selected him as the next attorney general, called the obstruction theory "fatally misconceived" and said that it was based "on a novel and legally insupportable reading of the law." Barr acknowledged that he did not know what type of case Mueller was pursuing, but argued that Trump's firing of former FBI Director James Comey didn't constitute obstruction and that the president shouldn't be forced to testify to Mueller's investigators. Now the Democratic leaders of Congress - House Speaker Nancy Pelosi of California and Senate Minority Leader Chuck Schumer of New York - issued a joint statement Sunday calling Barr biased. House Judiciary Chairman Jerrold Nadler, D-N.Y., said he would call on Barr to testify about his reasons, describing his conclusion as "a hasty, partisan interpretation of the facts." Obstruction was a central subject of Barr's confirmation hearing. Barr had argued in his unsolicited memo that the Constitution permits Trump to make his own personnel choices, and can wield the powers of his office even on subjects in which he has a personal interest. To conclude that Trump acted "corruptly," as federal obstruction statutes require, if he tries to influence a proceeding in which his own conduct is scrutinized is "untenable," Barr said. 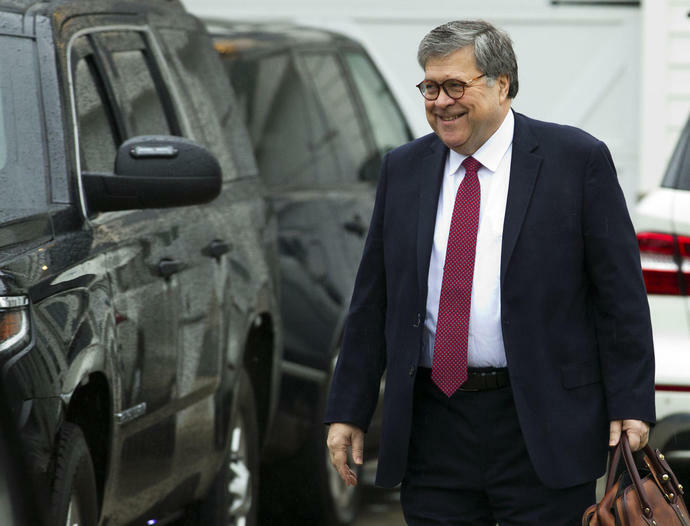 "Because the Constitution, and the Department of Justice's own rulings, envision that the president may exercise his supervisory authority over cases dealing with his own interests, the president transgresses no legal limitation when he does so," Barr wrote. Barr also said that for investigators to conclude that Trump had obstructed justice, they would first have to find that he coordinated with Russia to win the presidency. Mueller's investigation didn't find that anyone from the Trump campaign conspired with Russians, according to the summary Barr revealed on Sunday. Others disagreed. Jens David Ohlin, vice dean and law professor at Cornell Law School, said Sunday that evidence for an obstruction charge was clear from Trump telling Comey to back off his investigation of National Security Adviser Michael Flynn's contacts with Russians during the transition, Trump's firing of Comey and Trump's later statement in a television interview that the firing because of the Russia investigation. "The evidence for obstruction is as clear as day," Ohlin said. "The Russia investigation threatened the Trump presidency and Trump's political legitimacy. This alone is enough to establish the corrupt intent necessary for an obstruction conviction." Barr said his decision wasn't based on the department's policy against charging a sitting president. "In cataloguing the president's actions, many of which took place in public view, the report identifies no actions that, in our judgment, constitute obstructive conduct, had a nexus to a pending or contemplated proceeding, and were done with corrupt intent…" Barr said. Beyond that, he offered little detail about how officials reached their conclusion. "We've said from the outset there was no collusion, there was no obstruction," Sekulow said. "And now we have the weight of the Department of Justice agreeing with us." "Given Mr. Barr's public record of bias against the Special Counsel's inquiry, he is not a neutral observer and is not in a position to make objective determinations about the report," the leaders said. "Congress requires the full report and the underlying documents so that the Committees can proceed with their independent work, including oversight and legislating to address any issues the Mueller report may raise. The American people have a right to know."